If you walked through Government Center on Election Day, you probably noticed the long line of voters that twisted through the brick concourse, down the steps, and around City Hall. This is because it’s been decades since Boston made major adjustments to equalize precinct sizes, causing stress on voter locations in quickly growing neighborhoods. To alleviate this, some precincts may soon be subdivided, easing voter congestion and improving poll accessibility in future elections. 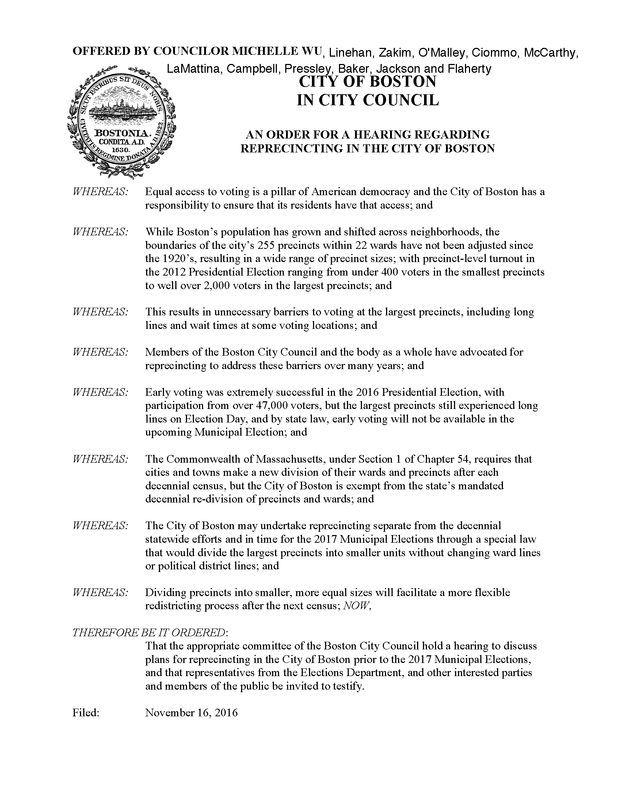 Boston City Council voted to pass the home rule petition co-authored by Council President Michelle Wu and Councilor Bill Linehan to add additional polling locations in the six largest Boston precincts. The recommendations came out of two public hearings with the Elections Department and community members. Since Boston last made changes to precinct sizes, the city’s population has shifted such that today our biggest precinct (Ward 3, Precinct 8 in Chinatown) has over 6,000 registered voters, while the smallest (Ward 8, Precinct 6 near South Bay) has just under 500 voters. That means very long lines at certain polling locations and difficulty with voter access. The home rule petition would allow the City to subdivide these largest precincts in time for the upcoming municipal elections, without changing political district lines or ward lines. The four interior North End precincts would not be impacted, but Ward 3, Precinct 6 in the downtown / waterfront is on the list to be split up. 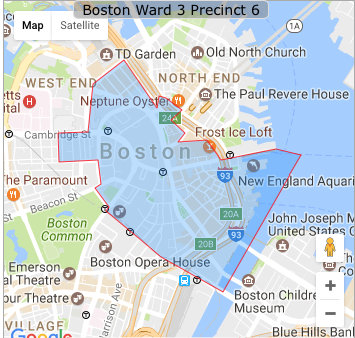 Other affected precincts are: Ward 3, Precinct 7 (South End); Ward 3, Precinct 8 (Chinatown); Ward 5, Precinct 1 (Bay Village, Chinatown); Ward 6, Precinct 1 (Seaport, Fort Point, South Boston); and Ward 9, Precinct 3 (South End/Lower Roxbury). The changes would need to be approved by the state legislature by June at the latest to implement in time for the September 2017 Preliminary election. If approved, the home rule petition would allow for voter registration locations to be changed in the statewide system. Read more details from the first reprecincting hearing on Michelle Wu’s Facebook page. The original order from November 2016 is posted below. Re district everything. The current map is based on populations that no longer exist and new ones that have yet to be acknowledged. The house by house vote-getting gerrymander of ward 3, precincts 1-4 is dramatically different from the system we need to properly serve today’s and tomorrow’s population. We have technology that does this without bias. Put it to work.